Foreigners applying for a teaching licence might be exempted from sitting the mandatory 20-hour Thai language and culture course. Chaiyos Imsuwan, deputy permanent secretary of the Education Ministry, said yesterday that the task of training teachers in Thai culture might be left to their employers, as the schools could work with one of the Rajabhat universities to provide a programme. Schools would get a rough guideline on the training from the Teachers Council of Thailand (TCT), which will soon consider proposals for changes including dropping the training. The programme was too short to change foreigners or equip them with enough knowledge, so it wasn’t necessary to make it a requirement for a licence, said Chaiyos, who is also the acting secretary general of the TCT. Another proposal was for foreign teachers to be able to renew their licence twice – once after five years and again after hitting a 10-year milestone, when they can apply for a permanent licence. A licence could be cancelled for a serious breach of professional ethics. The amendments were aimed at improving the agency’s operating effectiveness. The TCT is also considering the accreditation of education programmes at universities. In the past, the TCT set up a committee to check on an education programme after the university’s council and the Higher Education Commission approved it. However, by the time the panel was set to check readiness and compliance with occupational standards, the university would have already launched the programme and sometimes enrolled more students than it had reported. An amendment could require the university council to reach an agreement with the TCT first so the council could provide advice and confirm approvals for the university’s programme. If the university fails to heed recommendations, the TCT would not certify the teaching diplomas from that programme nor issue teaching licences to its graduates, he added. 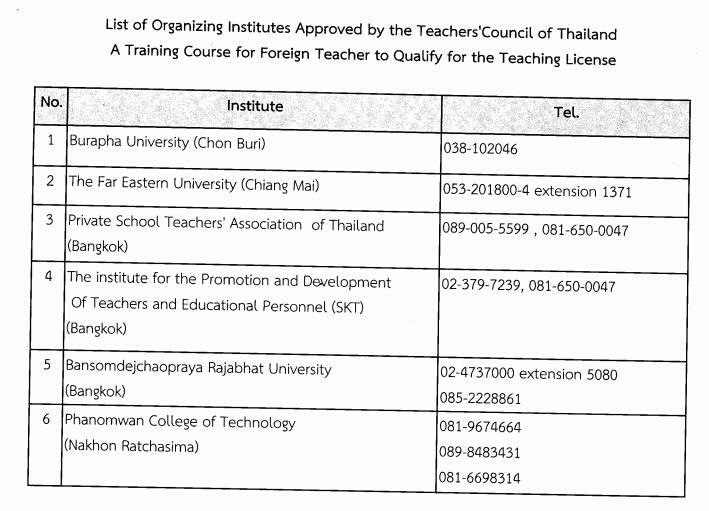 Unless I'm mistaken (which I could be) the very last time the Teacher's Council of Thailand offered that "Thai Language, Culture, and Professional Code of Ethics for Foreign Teachers" course was back in August of 2014! They were going to re-work it but nothing ever came of it. Need to have some TEFLers/teachers come forward and update the current requirements. I'll go out on a limb and suggest that the procedure and courses aren't in use officially - be it a proper WP-designed position or the innumerable casual off-the-books situations. Much overloading of surface bureaucracy yet never placed into practice. All too common, and quite typical, for the Thai systems. As of 28 December 2015, there were six institutions accredited to run the Thai Language, Culture and Ethics Course. The requirements to be able to take the course were changed. Now only people with a BEd or other such qualification that would allow them to get a teacher's licence (rather than just a waiver) are eligible to take the course.